Opportunities to innovate don’t come along every day. Since I arrived at UF in 2006, I have attempted to identify avenues through which the college could advance. Some opportunities are just lying there, waiting to be seized upon, and others only become apparent after lots of exploration of ideas with many people. These innovations are literally created. Whether a college advances or doesn’t depends largely on the extent and rate of innovation it is able to implement. One of the most rewarding innovations during my deanship was the building of the new Small Animal Hospital. This was an example of an opportunity that was waiting to be seized upon. The stars literally lined up, and we now have a facility that supports all of our programs and is the envy of virtually every other veterinary college. This project has spawned further innovations, such as the 24-7 Emergency and Critical Care service and the after-hours emergency clinic in Ocala. The new Integrative Medicine service includes rehabilitation, acupuncture, hyperbaric therapy and nutrition. Our Primary Care and Dentistry service is among the first among veterinary colleges nationwide to institute the Partners for Healthy Pets program being promoted by AVMA. Our renewed focus on service to referring veterinarians, clients, and our animal patients has provided more teaching caseload for our students and residents, and a more viable business plan to fund our mission. 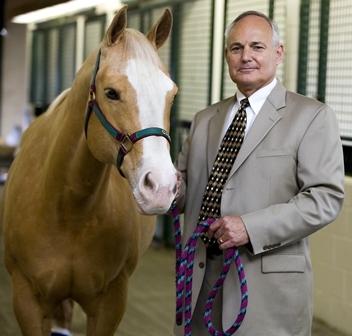 At the Large Animal Hospital, we have developed a growing program in lameness and imaging, offering unique services and expertise. To provide a wider range of equine experiences for our students, we created a program for external clerkships with Florida practitioners. The Dairy Extension program is now shared by several FARMS faculty to broaden its reach and integrate it into student teaching. Our unique program in Aquatic Animal Health now extends to research on infectious disease, production aquaculture, rehabilitation, distance education, Extension, and toxicology. Our shelter medicine programs are second to none. We also instituted a courier service in clinical pathology to better serve local practitioners. The facilities at the UF CVM were great when I arrived, but we have improved them even more. In addition to the new hospital, we constructed a new state-of-the-art auditorium and renovated two others. We also improved the technology in the surgery, histology, and anatomy labs. The old Small Animal Hospital was renovated and repurposed, and we completely redesigned and renovated the clinical pathology laboratories. The library was redesigned and renovated to become a more student friendly learning center. In research, we committed to recruit more basic scientists to bolster research funding and enhance our stature among our peers. We also created a strategic focus in immunology and inflammation and successfully recruited several faculty into this area to complement and enhance the work of existing faculty. We also recruited strong faculty in other basic sciences to meet our research and teaching missions. We also created an innovative enrollment expansion program, enhancing college finances and providing more opportunities for students to obtain a DVM from UF. Staff positions and reporting structure were adjusted and streamlined within the college’s administration. All but one of the dean and department chair positions are new appointments, and the chief of staff of the hospitals position was created. We also created a new position in Development by adding a liaison position in the hospitals. Ultimately our progress depends on the people who work here. Everyone has a role to play, with their own contributions of talent and creativity. Being dean is a lot like conducting an orchestra: Everyone doing their own thing in an unorganized fashion is not very effective, but everyone contributing their best at just the right time and in just the right way is a beautiful thing. When this happens at the college, we are awesome. We try very hard to position talented personnel in the right roles, to keep us all working within a great environment. The constant struggle to achieve this is what I get my greatest satisfaction from and what I will miss most when I leave the deanship on July 1. I think we have made great strides, but we have so much more work to do. There are more opportunities just waiting to be developed, and more innovations in store. Although I regret leaving with so much unfinished business, I will leave knowing I have given my best and feeling confident for the future of the college in the hands of the very capable faculty and leaders we have assembled. It has been a distinct honor to have had the opportunity to lead our college and I sincerely appreciate all the support and friendship from so many people. Thank you and Go Gators!